I am always looking for unconventional, yet elegant, ways to use The Deck of Shadows, Tarot cards, and other divination tools. In light of the upcoming holidays and their theme of gratitude, I wanted to share with you a spread I developed which is based on L. Frank Baum’s beloved 1900’s tale, The Wonderful Wizard of Oz. Naturally, The Wonderful Wizard of Oz is powerfully and imaginatively built around the words, There’s no place like home . . . In The Wonderful Wizard of Oz, Dorothy is disconnected with her home, her family, and herself. She lives at her home, but she is not grounded with her home. Dorothy must take a daring, inward journey in order to reach the self-realization that the home she thought she left has more meaning for her than she originally recognized. In other words, home – particularly in this spread – stands for the concept of self-acceptance. Mr. Baum’s story readily contains many charming metaphors and life lessons – some likely intended by the author, others eventually found by the personal observations of the various fans of the stories. Irrespective of your approach, the fable is what is known as a circular journey; a voyage or passage in which the final destination is exactly the same as the place of departure. This type of story is like Nature’s cycle of the seasons and plainly represents the psychological or hidden wheel that turns one’s life. It is not just about a homecoming. Rather, it is about an internal change in someone – while their external world remarkably remains the same. Circular stories also provide a ready example of cause and effect; one thing or decision leads to another thing or decision. You know how the story starts and how it will end; it is the journey between the two points that holds the most significance. Further, circular stories are, by definition, predictable. How appropriate, then, to use this construct for a reading. 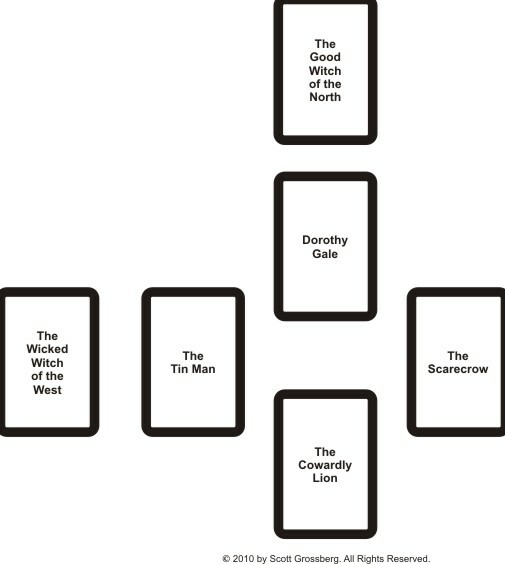 Use The Wizard of Oz Spread to look within to find your or someone else’s power. Oh, and one more thing – never give up your silver (ruby) slippers! Make sure to sign up for my blog mailing list so you get all future postings delivered directly to your inbox. This entry was posted in Uncategorized and tagged Deck of Shadows, divination, layouts, oracles, readings, spreads, tarot by scottgrossberg. Bookmark the permalink. You turn the wheels of my imagination, Scott. This is a great spread. I’m going to try it this afternoon. Very nice. Love the Wizard of Oz. I love this spread and loved your talk on BTR/Beyond Worlds. If you don’t mind, I want to add a card to this spread: Toto the dog….what should I remain loyal too? What do you think about this? I ordered the deck of Shadows and can’t wait to get them! Alexsandria – Thank you for your kind words. Naturally, I recommend including Toto in with your reading. If you’ve listened to me, before, you know that I’m not about rules when it comes to readings. Obviously, your use of the “loyalty” factor makes perfect sense. One thing to think about, though . . . the name “Toto” means “whole” or “complete” and likely drives from the Latin. Perhaps, Toto is more about what it takes for the soul to be complete than singularly being about loyalty. In fact, if you look at the various characters (Dorothy, The Scarecrow, The Lion, and The Tinman), they are ALL loyal in one way or another. Toto, on the other hand, is that playful spirit of the Universe – much like the Fool in the Tarot – that moves all the other characters forward. Indeed, there really wouldn’t have been a trip back to Oz in the first place but for Toto, and Dorothy would not have learned the lesson of the silver/ruby slippers if Toto hadn’t run away to chase a cat. Toto is also the one that exposed the Wizard, ran for helped, escaped from danger, etc. Just some things to thing about. Thanks sooo much for replying back to me. You make a very valid point. I also see Toto as the dog in the Fool card. It makes so much sense. Yes, I relate dogs with loyalty and this is my reasoning for adding Toto to the spread. However, I didn’t know the meaning of Toto’s name. Thank you for giving me a new awareness to discover another way to use the card in the spread. Also, over this thanksgiving weekend, I flipped channels and happened to find WHAT!?!? THE WIZARD OF OZ…I had a blast watching it and psychoanalyzing the characters…I will certainly share more about the spread, but wanted to send my appreciation for your comments!